The science-driven breeding of stress-tolerant cultivated plants, that would allow for a reduction in harvest losses and undesirable decrease in quality attributes, requires a new quality of knowledge on molecular markers associated with relevant agronomic traits, on quantitative metabolic responses of plants on stress challenges, and the mechanisms controlling their biosynthesis. The research group of Dr. Corinna Dawid, therefore, develops and applies mass spectrometry based techniques of metabolomics and proteomics to quantitatively assess key metabolome alterations in plant-derived foods induced by biotic stress challenges (bacteria, fungi) as well as abiotic stress conditions, including water stress, light stress, and mechanical stress. An example on the influence of mechanical stress on the metabolome of different carrot genotypes is displayed in Fig.1. To translate the knowledge on how stress-resistant traits master their successful defense against stress conditions into breeding programs, genotype specific metabolome alterations are characterized and gene clusters controlling the biosynthetic pathways of key stress metabolites are identified by means of genome-wide association studies. This research will help to navigate breeding programs and to optimize post-harvest treatment of plant-derived food products from producer to consumer/processor towards the production of high quality food products. Fig. 1. 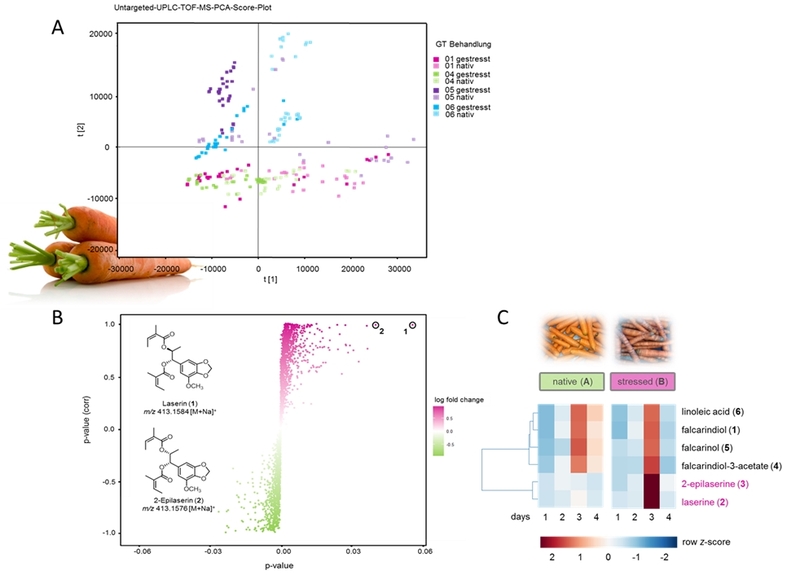 (A) PCA-Score-Plot of mechanically stressed carrot genotypes, (B) OPLS-DA-Score-Plot of stressed (red) and native (green) carrots of one genotyope (UPLC-ToF-MS) with laserin and epilaserin as bitter tasting, mechano-stress metabolites, (C) temporal influence on key metabolite alteration.